Nasco Equipment Company was started by H.P. Bones of Elba, Alabama in 1963 with money put up by National Security Insurance Company and 63 other stock holders. Nasco's first forklift was a DF Model, in which Nasco produced for over 20 years. Nasco's primary market was in the lumber industry, but in the early 1980's, Nasco had a vision of moving to other markets. April 2, 1981 - Toyal Jackson was hired as Marketing and Sales Director and took the company's vision to reality. Nasco made a move into the Salvage and Auto Auction Industries, and several others while continuing the relationship with the Lumber industry. Spring of 1985 - Toyal Jackson and a partner gained controlling interests in Nasco Equiment. December of 1993 - Nasco rolled off its 4th model, the "DM4WT" which lead Nasco to the front on pussh button, four-wheel drive technology and the reliability of Perkins Engines. September of 1998 - Toyal Jackson gained controlling interest in Nasco Equipment due to the passing of his partner and soon after completed the purchased of remaining stock. March of 1999 - Chack Jackson came to Nasco Equipment in order to promote attachments and help in the sales department. March of 2001 - Nasco Equipment released the DN4W Model, in which used the John Deere Power Tech Diesel Engine and ITL axles and transmissions put Nasco Equipment into a new weight class of up to 18,000 pound lift capacity. This OEM partnership with John Deere has helped Nasco provide better service for its customers. May of 2005 - Casey Waters was brought in as the Parts and Service Manager and has revamped the Parts and Service department with a state of the art computer sytem to handle material inventory, in our post 9-11 world things take longer to get, but with Nasco Equipment's vision of fully stocked in house parts department has become a reality. 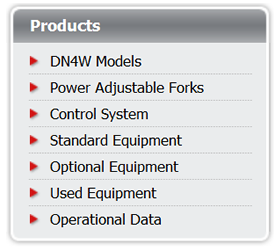 Nasco Equipment can ship you any part for our DN4W model out the same day 98% of the time. September of 2005 - Toyal Jackson semi-retired and turned the day-to-day operations of Nasco Equipment over to Chad Jackson. Nasco continues to improve the DN4W mode. May of 2008 - Nasco partnered with Kysor-Bergstrom, one of the world's largest producers of aftermarket heating and air conditioning systems to improve that aspect of the DN4W Model. Fall of 2008 - Nasco began a large dealership endeavor with Nortrax Equipment Company, led by company visionaries Toyal and Chad Jackson and has currently signed on 10 Nortrac dealerships located in South Florida. Nortrax has a total of 30 dealerships in the Northeast and Midwest, in which Nasco is currently pursuing. Nasco Equipment Forklifts is an American made product, Hand-Made by Americans, some of which have been loyal employees for over 30 years. Nasco Equipment enters their 46th year in the busines and intend to be here at least 46 more.